life of luxury could not take away things such as sickness, old age, and death. He subsequently renounced his luxurious lifestyle in an effort to understand the way to true liberation. At the age of 35, after approximately six years of study and meditation in the Brahmanic traditions of the time, he came across a "middle path" answer to his question and was enlightened. The word Buddhism has the root word Budhi, which means "to awaken". 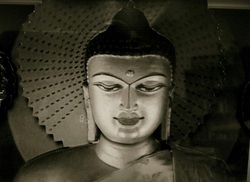 Buddha meaning "Awakened One". While some may think that enlightenment is the end game, Buddha realized that his enlightenment alone was not enough. He spent the rest of his life teaching the principles of Buddhism, called Dharma in Sanskrit (Dhamma in Pali) or "Truth". He taught these truths in a variety of ways, which later became the basis of the different schools of Buddhism, until his death at the approximate age of 80. The teachings in all Buddhist traditions follows this model and is therefore to help assist all beings in their quest for understanding and to awaken their own Buddha nature (enlightened potential) and to awaken to the liberation from suffering. All schools of Buddhism, (Theravadin, Mahayana, Vajrayana, and Zen schools) aim to explain a direction to life, highlighing the ways in which suffering occurs in individuals lives, and provides a means to practice a compassionate way of living that leads to true happiness and liberation. Buddhism is a belief system which does not argue against other beliefs or religions. Practitioners of Buddhism should not be concerned with labels such as 'Christian', 'Moslem','Hindu', 'Pagan', 'Athiest' or even 'Buddhist'. Rather, the direction should be to help all to awaken to the innate potential that is theirs. In many cases, there are individuals who implement Buddhist teachings into their own spiritual tradion. Thomas Merton is one example of this. In Buddhism there is generally no push to preach and convert others to follow the path. Rather, Buddhist teachers are called to explain some aspect of the Dharma if someone asks a question. Buddhism invites us to awaken to our lives, and per the Bodhisattva ideal not solely for our benefit, but for the benefit of all beings.